With a complete redesign, drivers can see the 2019 Toyota RAV4 again for the first time. This four-door compact SUV offers more of what you expect in a sport utility vehicle with premium amenities and modern style. Choose from six trim levels with seating for five: FWD LE, AWD LE, FWD XLE, AWD XLE, AWD Trail and AWD Limited. Thanks to a powerful stance and chiselled lines, the 2019 Toyota RAV4 brings more energy to the compact SUV category. Changes to this model include a longer wheelbase with a wider track for improved stability. High ground clearance means you aren’t limited to the highway for your adventure. Four new colours ensure you make a statement that fits your personality, including Midnight Black Metallic, Magnetic Grey Metallic, Lunar Rock and Blue Flame. With the ice-edge coloured roof, you will notice an impressive contrast in a two-toned exterior. 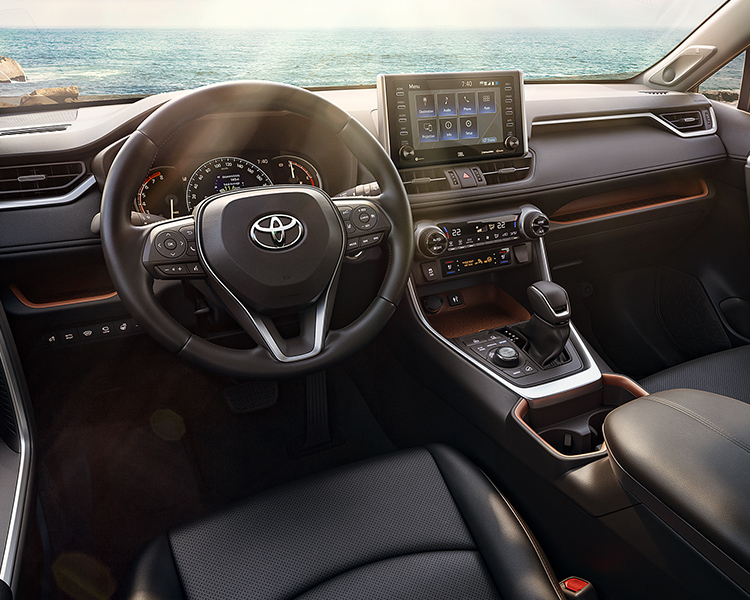 Even though the exterior design is rugged and tough, the interior of the 2019 Toyota RAV4 is all about luxury and premium materials. Relax in the available eight-way power adjustable driver seat with memory. 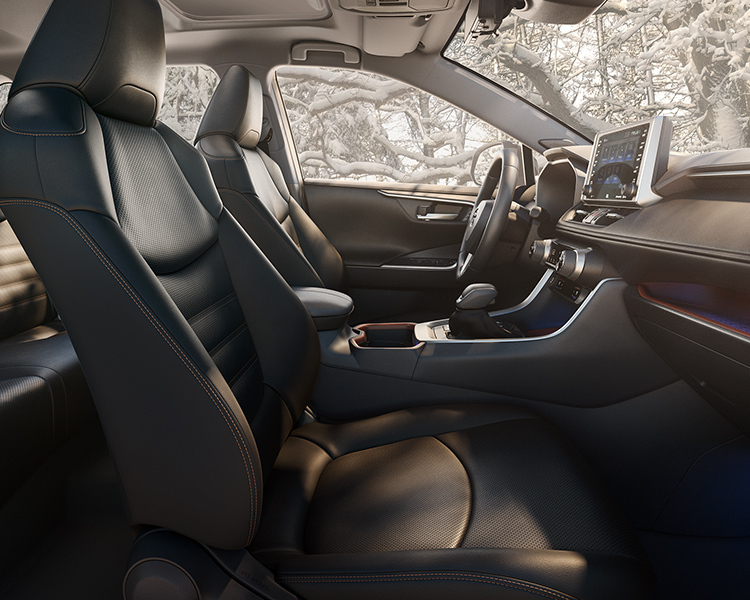 Optional heated front and rear heated seats keep everyone warm in the cold winter while available ventilated front seats make it easier to keep your cool in the hot summer. Thanks to 60/40 split folding rear seats, you have more options to haul cargo as well as passengers. Standard on the 2019 Toyota RAV4 is Entune 3.0 audio which keeps you connected and entertained. Keep track of sports, stocks, weather and more with this system. Get even more with Entune Plus or Entune Premium for roadside assistance and navigation help. Listen to your tunes through the amazing available sound system of JBL audio with nine speakers. Make the most of your 2019 Toyota RAV4 with the right accessories. Add a cargo net or tray to keep your items organized. Tie-down rings ensure everything stays in place. Thanks to the Pro Series paint protection film, you don’t have to worry about those little dings and scratches that happen with life. Powered by a 2.5L 4-cylinder engine which is new for this model year, the 2019 Toyota RAV4 has what you need to get you where you want to go. This engine is paired with an eight-speed automatic transmission for sporty acceleration without sacrificing fuel economy. Choose all-wheel drive to keep you on the road when others are sidelined. Thanks to multi-terrain select, you can set the system for as much traction as you need on sand, rocks and dirt or just heading down the highway. 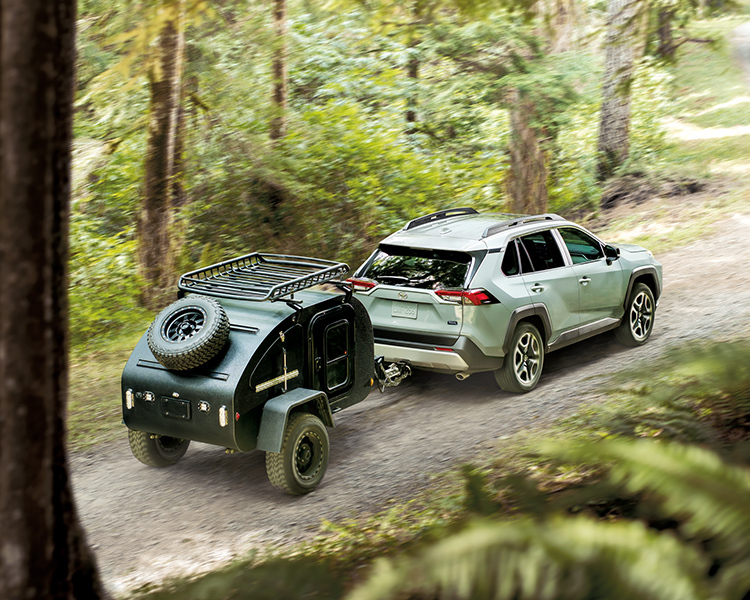 Take the lead with the award-winning safety of the 2019 Toyota RAV4. Feel good about where you need to go with the advanced safety systems in the 2019 Toyota RAV4. Every 2019 Toyota RAV4 is backed by an outstanding Toyota warranty. 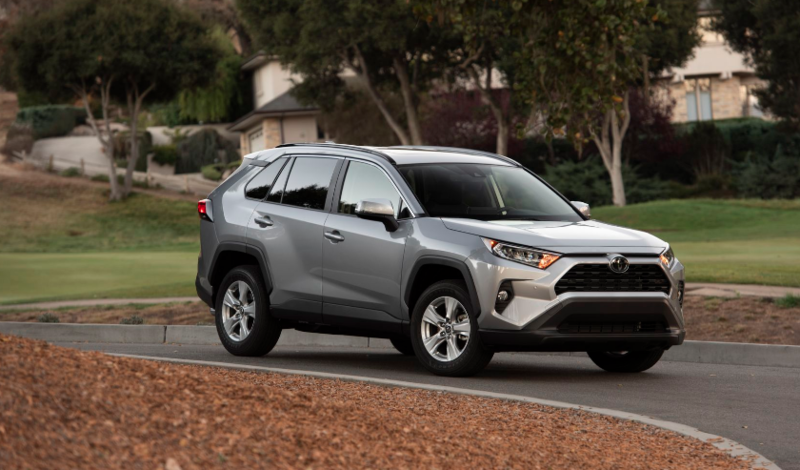 With a new look and even more impressive performance, the 2019 Toyota RAV4 is going to capture your attention. Enjoy premium safety and comfort with modern technology in this SUV. Find out more about the 2019 Toyota RAV4 and what’s changed on this model when you come into Gateway Toyota. Stop by and talk to our sales team as you go for a test drive at your local Edmonton Toyota Dealer – Gateway Toyota.